What happened was that when Onew and Minho were introducing Lee Jung’s comeback stage on MBC’s Music Core when suddenly Minho’s microphone stopped working. Minho looked surprised for only a moment, and Onew displayed quick thinking by handing his mic to Minho. 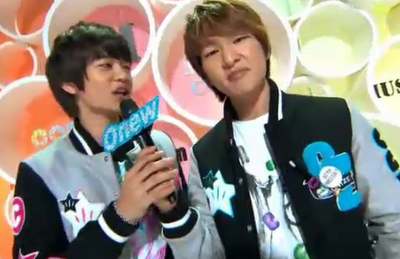 As soon as Minho received the mic from Onew, he acted as if nothing had happened and continued naturally. And because of their professionalism, they had received many compliments and praises. SHINee’s Onew made a star call and in the star call, he mentioned about this particular incident. He humbly said that it was natural for them to react that way but was still very thankful for the praises he had received. Because Minho’s mic didn’t have sound (during Mucore), so I gave my mic to him. Everyone seems to have exaggerated since we just did this naturally by carrying on and speaking through the mics. If we didn’t speak, we would be using the mics of the people next to us. But anyway, thank you so much for praising me! The weather is changing now so be careful of a cold and please continue to support us! I love you all! Hello! I am Taemin, how are you? Yeah, today, expected for a long time, do you know what day is today? Today is… we SHINee debut 900 days! I can still remeber that I was very frightened on the debut day, and now 900 days has passed and it is really surprising! For the later 9000 days, 90000 days till 100000 days, please be with us! Because of her question, so I… I …. Key: Which part do I like? Ah! It seems to be that part in “Hello”. Will you listen to Minho’s rap and Onew’s part? Time to say goodbye. Bye! Please send us more, we will read them.